We are temporarily open for business once more! The store will be taking orders once more up to the middle of August 2009. Any orders we receive before August 15, 2009 will be processed. We have some tee-shirts in stock (mostly XL) and they will be dispatched straight away. Any additional stock required will be ordered from our supplier on August 15, 2009, hence the mid August deadline for you to submit an order. Turnaround time from the supplier is about 2 weeks and I will ship the goods as soon as I have them and I have received a cheque in payment from you. Stickers are however readily available, and will be supplied upon order. 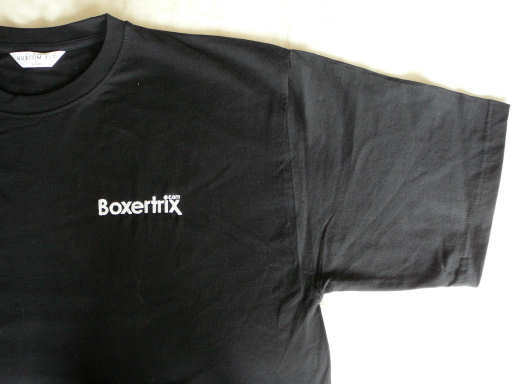 Boxertrix.com stickers are cut vinyl with the "Boxertrix.com" logo in either silver or black. Each letter of these stickers is cut individually from a sheet of vinyl. The size of these cut vinyl stickers is 115mm X 25mm. and they cost £1.50 each. T-shirts are available in any colour you like, as long as it's black. 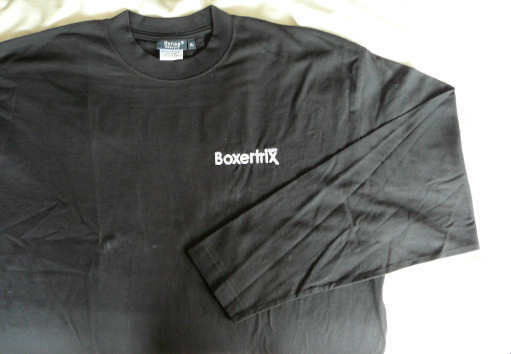 We use heavyweight, good quality 100% cotton t-shirts made by Kustom Kit, which have the Boxertrix logo embroidered in white over the left breast. 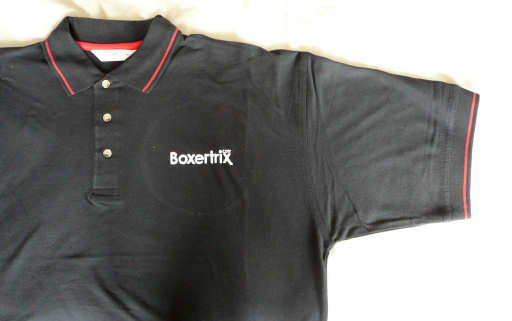 There is also a large back print in white of the Boxertix.com logo. The Tee shirts are £13 each. Size: S to fit 38" M to fit 40" L to fit 42" XL to fit 40/42" XXL to fit 46/48"
Size: S to fit 38" M to fit 40" L to fit 42" XL to fit 44" XXL to fit 46/48"
These long sleeve tee-shirts are black, with the embroidered Boxertrix logo on the front left breast and the backprint, the same as the tee-shirts. These shirts are heavyweight 100% cotton, made by Hanes. The cost for these shirts is £14. 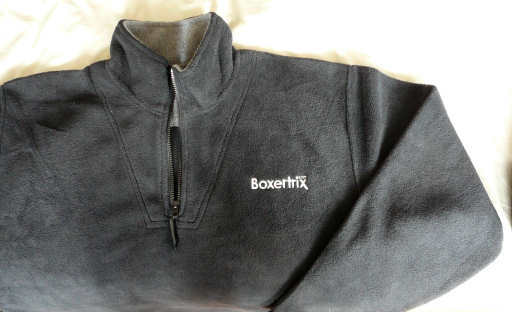 Size: S to fit 36" M to fit 38" L to fit 40/42" XL to fit 44" XXL to fit 46"
Heavyweight charcoal zip neck fleece made by Jerzees, with grey trim around collar and Boxertrix logo embroidered on the left breast. The shirts feature two zipped pockets on the front and an elasticated drawstring waist. Cost per shirt is £22. Size: S to fit 37/38" M to fit 39/40" L to fit 42" XL to fit 43/44" XXL 45/46"
Once you have submitted your order you will be contacted by e-mail with payment details.